I don’t smoke. Thankfully, I never have. 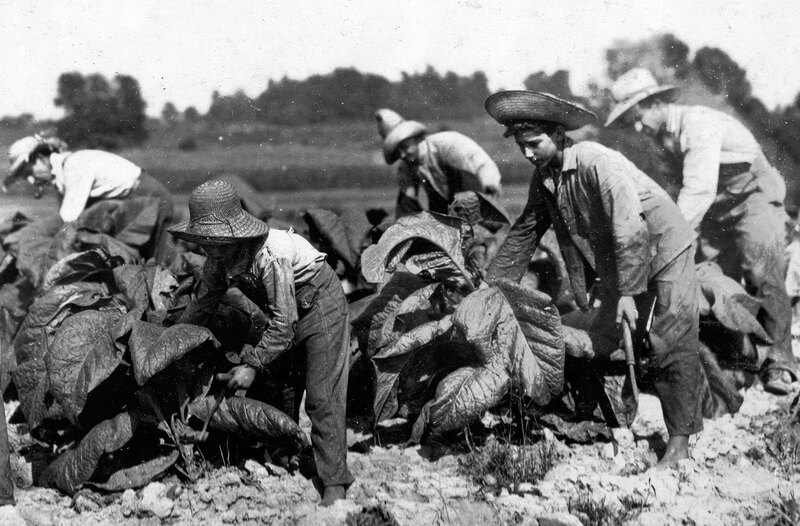 But I was once a teenager with dreams of post secondary pursuits and tuitions that would need paying, and so, like most young people in my hometown, my summers were spent working on a tobacco farm. I’ not writing to celebrate the tobacco industry, but rather to reminisce over an experience. When I was thirteen, there was no internet. I had access to whatever television channels could be had by using an manually turned antenna. My friends and I never heard of a social movement to rally against an industry. I didn’t know of any one who’d had cancer. My employment predates the infamous Philip Morris lawsuit. The Canadian icon, Stompin’ Tom Connors, was talking about my hometown when he sang “Tillsonburg My back still aches when I hear that word”. The farm he’d worked on was just up the highway from where I lived. 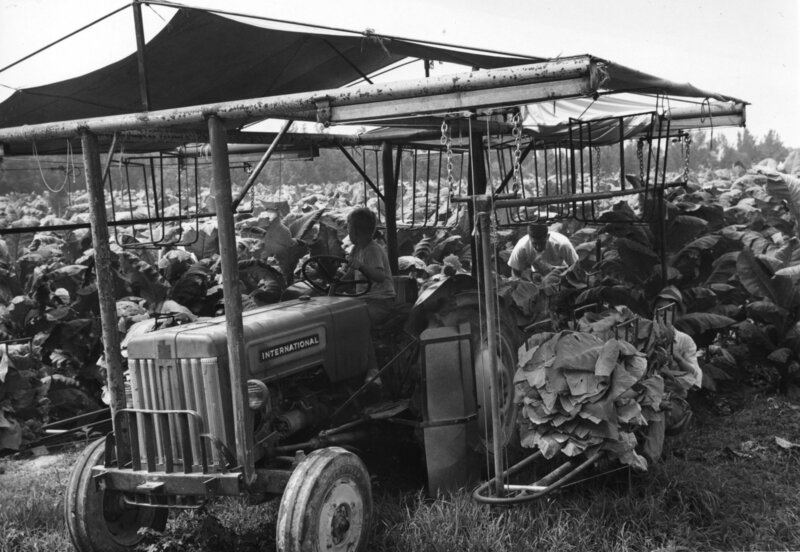 I worked summers on a tobacco farm from the eighth grade through to the end of college. 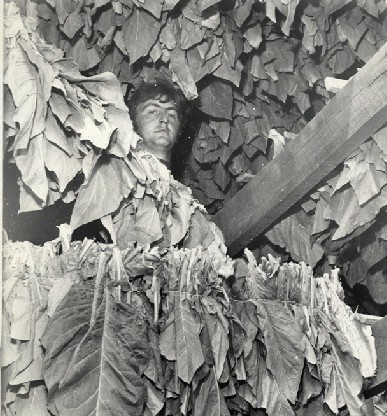 For a couple of those summers, I did the same job that Tom sang about; I primed or picked the tobacco leaves. It was rather unusual for a farm to have a female primer. It was the early eighties and task assignments were determined by gender. I can tell you that priming increased my bicep measurement and I was quite proud of that! I’d finish school at the end of June and wait anxiously for the phone call that usually came a few weeks later telling me that the tobacco was ready for picking. The work season for me lasted from mid July to the end of August, just in time for school to resume. Not everyone made it back to school for the first day. The season wasn’t over until every field was completely stripped of leaves. It wasn’t unusual for some students to miss the first few weeks of school because they were still working. This practice wasn’t encouraged but neither was it frowned upon. I was lucky to return to the same farm each summer to work for a very nice Belgian family. A number of the local people did the same year after year, and so there was a wonderful camaraderie among us. My summers were spent shoulder to shoulder with the mother of one of my classmates. She told funny stories and addressed me like an equal. I remember feeling so grown up because of it. If you visited downtown Tillsonburg on a Saturday night, you’d see groups of transient seasonal workers walking the streets, looking for someplace to spend their newly earned money. It was commonplace to see groups of young men hopping from the bed of a pick up. Men would come from the Caribbean countries like Jamaica or from Europe. On the farm, they stayed in a simple accommodation called a bunk house, and they took meals with the farm family. I remember working with men from Belgium and France. I was out of bed by 5 am, at the farm by 6 am and if the gang was proficient, the job was done by 3 pm. (We worked seven days a week for the entire season.) A gang included the primers in the field, the table gang and hanger in the kiln yard, tractor drivers. The man responsible for curing the tobacco carried a huge responsibility. His position was the equivalent of a brewmaster or a vinter. The golden colour of the dried leaves dictated the price they would fetch at market. He lived in the kiln yard for the entire summer and was up several times a night to make sure that the burners in the bottom of the kiln were set at the proper temperature. Over the course of the season, I usually earned about $2000 which at the time was sufficient to cover most of my annual tuition. During those years, I worked on the table gang and as a primer. During my college years, I worked in the greenhouse, pulling tobacco plants and placing them in wooden crates in preparation for planting. I even tried my hand at planting for one season, bumping along on the back of a tractor. Working on a farm wasn’t easy but I’ve always looked back on it with great fondness. There is great pride in a job well done. Farm labour lets you see the beginning and the end of it. Not every job does that. I also learned the value of a dollar and not to squander it. When I went to a store, I looked at a price tag and translated its value into the number of heft tobacco bundles I had to hoist onto a wagon. That certainly slowed my spending. The group I worked with were like characters cast in a play, each holding their own charm. I learned to listen, observe, and understand. At first, some people may seem grating or unreasonable, but if you listen long enough, you’ll always hear a back story that explains their nature and takes the sting out of their words. This was perhaps the most precious and enduring lesson of all. Do you have a memory to share? Some information to offer or perhaps a question? 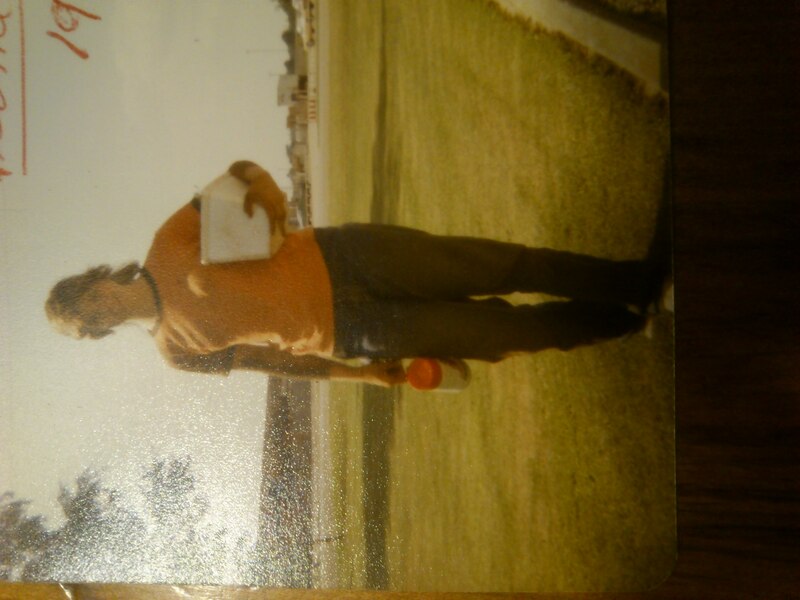 Me after a hard day of priming in 1981. My arms are black with gum from the tobacco leaves. This is a kiln. 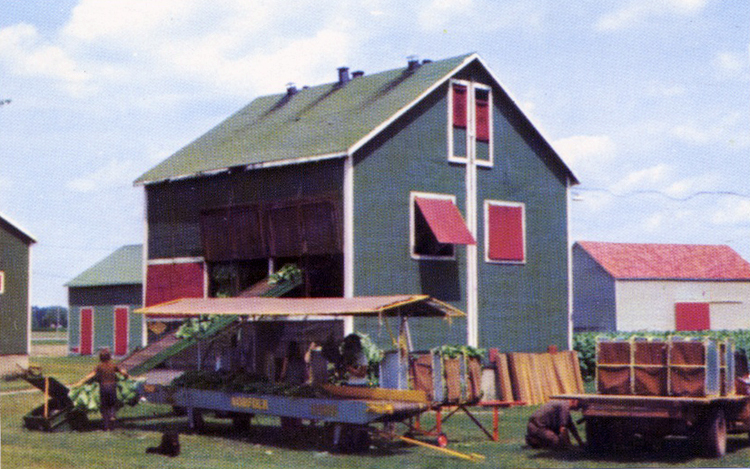 You can see the escalator, the table covered by a tarp roof, and to the right is the wagon carrying metal baskets full of tobacco. The first two photos in this post are actually of farm scenes from the American south. I wanted to share them because they depict aspects of my experience. Ah.. you’re making me think I should do the anthology after all– lovely memories and you bring out the values of farm work– so true that these don’t exist in other work. There’s a sense of accomplishment that can’t be experienced elsewhere. Thanks for sharing- and great photos too. How wonderful to hear from you! I’d been thinking of emailing soon. I’m glad you enjoyed the read. You may also like: http://www.pinterest.com/gwentuinman/professionally-speaking/. It’s my collection of vintage photos of people working around the world at various jobs. Perhaps you will be inspired to pursue the anthology:) What you proposed sounds so interesting! Reminiscing about your youth, and it made for some interesting reading, Gwen…Mom’s sisters traveled from Pickering to that area to work in the tobacco fields too…that was back in the 50’s. Thanks for sharing your story, Gwen ! I’d love to hear more about that when visit. At that time, there was no sewing mechanism. The women pulled the leaves from the pile and “hand-tied” around a stick. Our machinery broke down once, so rather than lose a day, the older ladies hand-tied for an afternoon. It was fascinating to watch. Now, the technology used when I worked is completely obsolete. The green and red kilns are no longer in use. This is really interesting Gwen – what a great experience to have had. What kind of summer jobs were typical for you and your friends? I didn’t get my first job until I left school, when I was a Christmas gift pack maker – I had a couple of years before I went to college and couldn’t get another job, so I did some volunteering – with older people reminiscing about their lives. While I was at uni I was a cleaner in the holidays in an old peoples’ home. Nothing as interesting as working on a tobacco farm! I think your jobs hold fascination. There was a story and destination behind every gift. The reminiscing of the older people must have been captivating! wow, what an experience you had in your young years. It undoubtedly left an important mark on you. the story you have shared with us here is not only a reflection of your life but of times gone by when an industry once very popular, is hopefully fading into the past. How wonderful to hear from you! I hope you are well. At the time I worked in tobacco, there wasn’t an awareness of the health affects and smoking was considered a social activity. If we knew then, what we know now, I would likely have sought work elsewhere. May be a long time ago after your writing. 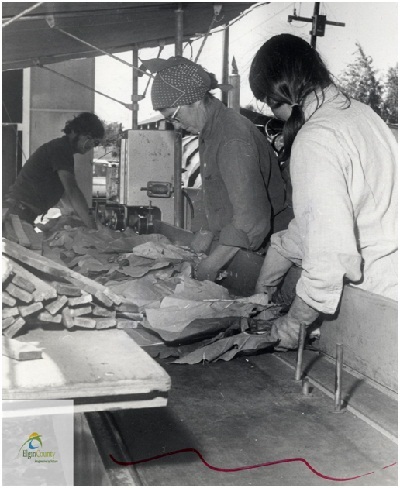 In 1968 and 1969, I came from France in the tobacco belt, near Tillsonburg, Delhi, Simcoe, between Lake Huron and Lake Erie. The first time, I was a picker. The second time, I was a kiln hanger. It’s great memories.